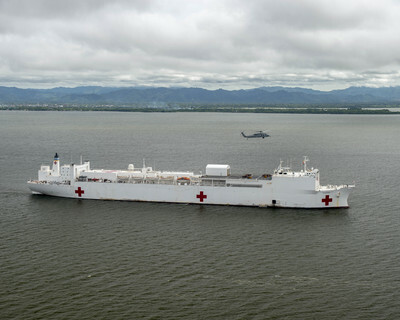 PANAMA CITY, Panama (NNS) — Hospital ship USNS Comfort (T- AH 20) transited the Panama Canal, Nov. 11, following a two-day port visit in Panama City. Comfort is headed north to Turbo, Colombia, for the third of its five mission stops. Having completed mission stops in Esmeraldas, Ecuador and Paita, Peru, the crew has already treated 10,224 patients with general medical, dental and optometry needs as part of the U.S. Southern Command’s 2018 Enduring Promise initiative. While Comfort was in port this past Friday and Saturday, senior government officials in Panama including Marcelo Lucco, ambassador of Argentina in Panama, and Ambassador Alejandro Daneri, president of Argentina’s White Helmets Commission, embarked the hospital ship to tour medical spaces, speak with U.S. Navy leadership and learn more about the medical assistance mission. U.S. Navy Deputy Surgeon General Rear Adm. Terry J. Moulton also visited Comfort during his concurrent trip to Panama. In an all-hands call delivered to the crew, he highlighted the work of the medical corps in Ecuador and Peru.